Turning ‘child labor’ into productive fun. Back in February, I wrote about PlayPumps International, a water pump built like a playground toy so that while kids play they are pumping fresh water for their villages. I love this. Usually, when people (often children) from a village have to go off to collect water, they carry heavy buckets on their heads, weighing them down. Over time they end up injuring their backs and necks from the physical stress. The Hippo Water Roller is a 90-liter drum meant to be rolled along in a healthier position, with the weight shifted to the wheel of the drum. One side includes a screw-on cap for storing the water. 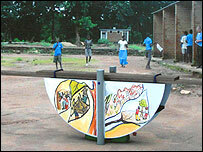 A young product design student, Daniel Sheridan, has invented a see-saw to generate electricity when kids play on it. After volunteering in Kenya last summer, Daniel came up with this idea and designed the playground old familiar toy – the see-saw – to be a bit more productive. This entry was posted on Tuesday, April 22nd, 2008 at 9:41 am and is filed under in the news. You can follow any responses to this entry through the RSS 2.0 feed. You can leave a response, or trackback from your own site.